In 1871, the South Parks Commission hired landscape designers Frederick Law Olmsted and Calvert Vaux to lay out 1055 acres of parkland. 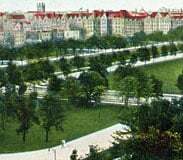 The designers envisioned two separate parks, later named Jackson Park and Washington Park, consisting of lagoons connected to each other by a long canal and boulevard, known as the Midway Plaisance. Financing problems arose following the Great Chicago Fire of 1871, forcing the designers to abandon their original vision, and the Venetian-style canal was never constructed. In 1890, Jackson Park was selected as the site for the World's Columbian Exposition. Fair officials decided that Midway Plaisance was an ideal location for restaurants, concessions, foreign villages, and ethnological exhibits. However, the most popular attraction on the Plaisance was a 264-foot wheel designed by George Washington Gale Ferris. After the close of the Fair, the South Parks Commission hired Olmsteds firm to transform the fair site back to a park. Once again, Olmsted petitioned to install a canal through the Midway Plaisance. Although the plan was approved, the canal project was again put on hold as the commission opted to install sewers, walks, drives, and bridle paths, and plant rows of elm trees along the drive. 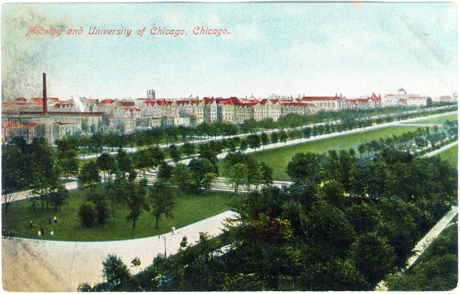 By 1900, the Plaisance had become a popular location for walking, cycling, ice skating, and sledding, as the newly founded University of Chicago (1890) brought a population of young academics to the area. 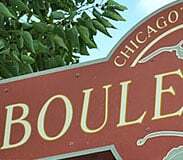 Since the latter part of the 20th century, the Chicago Park District and the University of Chicago have worked together to maintain and develop the Plaisance. Recent projects have included the restoration of historic landmarks and the development of gardens. At the west end of the Midway is a work of art that immediately grabs the attention of passersby. The Fountain of Time from 1922 is often considered the masterpiece of sculptor Loredo Taft, who spent nearly 14 years of his life creating this colossal work. On one side of a reflecting pool, Taft depicts Father Time, a haunting, 26-foot-tall form. He watches over a procession of 100 human figures, representing every phase of human life. Immortalized among the faces is Loredo Taft himself. The sculptor drew his inspiration from the poem "Paradox of Time" by Henry Austin Dobson,which reads: "Time goes, you say? Ah no! / Alas, Time stays, we go." Not even the fountain itself escaped the ravages of time. Taft originally wanted it to be made from marble or bronze, but both were too expensive, so he settled on concrete  which cracked and deteriorated over the years. But in 2007 after a $2 million restoration, the basin was filled with water for the first time in more than 50 years.